I wish the new book Palmistry Made Easy had been around when I was a kid. Of course, after finding out that he had a talent for palmistry, my dad wanted to learn to do it properly . He bought a copy of the classic palmistry textbook Cheiro's Language of the Hand and practised reading the palms of all our family and friends. Inspired by my dad, I borrowed the book and tried to pick up the palmist’s art. I was never as good as my dad – but perhaps that was because I never had the right book. I’ve just finished reading Palmistry Made Easy by Johny Fincham and I think that if I had had this to learn from I might have done better. It is, as the title suggests, aimed at beginners and is a very easy book to use for picking up the basics. One of the tips it starts with is to take a print of people’s hands and then spend as long as you like studying the lines to discern their meaning, rather than trying to work it all out in a few minutes while the hand’s owner is pressing you for answers to their questions. The book also has lots of photographs of prints taken from real hands to demonstrate each point. 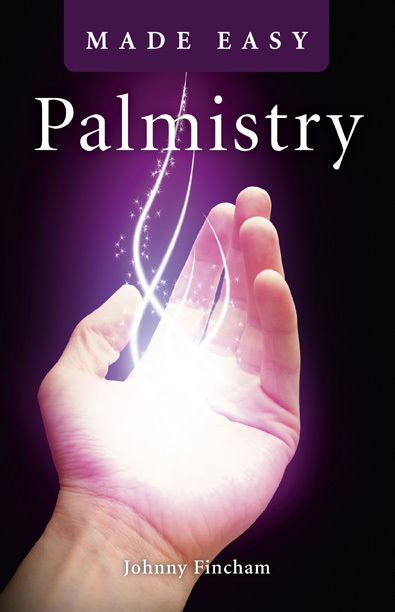 The chapters in Palmistry Made Easy are straightforward and cover each of the main things to consider when reading palms – the shape and size of people’s hands, skin texture, fingers, the patterns found on fingerprints and palm prints, the main lines on the hand and also the minor lines. None of the chapters are too long – and neither is the book too long. It is quick to read then to use as a reference when practising reading from prints of hands. I also like the way in which the focus of palmistry seems to have moved on since I first had a go at it. Back then, it all seemed to be a bit fatalistic - prophesying things like when you would get married, how many children you might have and even how long you were likely to live. Now, it is more about understanding someone’s personality, strengths and weaknesses to help them become happier and healthier. Our futures are not fixed. Johny Fincham points out: “The lines of the palm change over time.” To demonstrate this, the book shows prints taken from the same hand but several months apart, showing how acting on advice from a palmist can bring about change for the better. Publisher Dodona Books sums it up on its website: "Palmistry has traditionally been blighted by superstition and hocus-pocus. It's been impossible to learn the art from a long list of signs, markings and squiggles to remember. Until now that is. Here's a simple, commonsense guide that works. You can start palm reading after a few hours of study with this book. Using the modern language of psychology, rational observation and common sense, you'll be amazed at how much you can see in your own or anyone's palm. Try it - it works!" Johnny Fincham began the study of palms at age 25 while at university (in 1988) joined the (now defunct) chirology society, started to read hands professionally in 1996. Interesting. I've always believed that if you have a natural talent for something you shouldn't start reading the books. I'm a great believer in the teller getting the right signals from whatever shapes or lines they see. Same thing applies to Tarot cards. The images mean different things to different people and I think you should read what you 'get' from them rather than what the book says.